The new Fiat 500 has been winning award after award (e.g. european car of the year 2008) for its charm and retro look as well as for its reasonable roomy and security features. 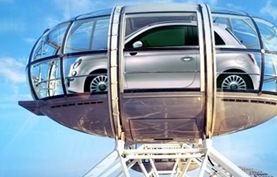 Now Fiat has chosen an extraordinary place to celebrate the launch of the Fiat 500: They placed one of the vehicles into a capsule of the London Eye where it will work circuits for the next two weeks. Great idea to show the size of the car. Does anyone know how much they paid for this? Or did they just take an special package of the London Eye offers?